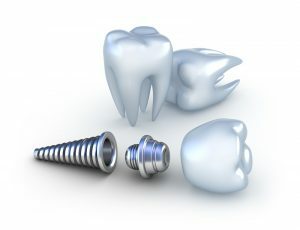 Dental implants are a remarkable advancement in dentistry, not just for their aesthetic appeal. While dental implants can improve a smile and restore confidence to an individual by replacing a missing tooth, dental implants actually do so much more to support and preserve your oral health. Did you know that when you lose a tooth, the bone structure where the missing tooth was rooted starts to deteriorate? Your teeth actually stimulate your jaw bone which helps maintain its integrity. When a tooth has been missing for a while, it’s often necessary to graft bone through surgical means prior to installation of a dental implant. The first step is to go over your health history to make sure you’re a good candidate for dental implants. Then if it is determined that no further bone restructuring is necessary to install the implant or implants, the next step will be taking careful assessment and measurements. Implant posts are then carefully installed with precision, and generally require at least two and up to six months to fuse properly to the bone before any restorations can be attached. The restorations are carefully created and fitted to look just like your natural teeth and require regular oral hygiene to maintain.